Anemia is a condition in which your red blood cells (RBC) are lower than the normal number or there is a problem with the hemoglobin protein inside them. Hemoglobin is responsible for carrying oxygen to your tissues and in some types of anemia the cells may have too little hemoglobin or it may be dysfunctional. Anemia can make you feel weak and tired. There are a variety of causes, from blood loss to deficiencies, and this will determine the type of treatment. There are three basic causes of anemia, which include reduced production of red blood cells, blood loss, and increased destruction of red blood cells. Deficiency of vitamins or minerals: Several of these are needed to make red blood cells and hemoglobin. The most common are iron, folate, and vitamin B12. Chronic kidney disease: When the kidneys do not function properly, they cannot produce a hormone called erythropoietin, which is needed to stimulate red blood cell production. Leukemia: A large number of leukemic cells in the bone marrow can reduce its ability to make red blood cells (as well as white blood cells or platelets). Chemotherapy: Chemotherapy kills rapidly dividing cells like cancer cells, but it also damages stem cells in the bone marrow that make red blood cells (as well as white blood cells and platelets), causing anemia until the stem cells are able to resume production. Bone marrow failure: Disorders that affect the production of blood cells in the bone marrow can cause anemia. These include aplastic anemia and Diamond Blackfan anemia. It is not uncommon for these disorders to also cause decreased production of white blood cells and platelets. Chronic disease: People who have longstanding chronic illnesses (lupus, rheumatoid arthritis, etc.) or infections (tuberculosis, HIV) may develop anemia. This anemia occurs because the body is unable to absorb iron or use the iron stored in the body well. Heavy menstrual periods (menorrhagia): This can lead to anemia developing over time. Inherited anemias: These alter the structure of hemoglobin or the red blood cell. They include sickle cell disease, thalassemia, and hereditary spherocytosis. Autoimmune hemolytic anemia: This is a condition in which your immune system gets confused and inappropriately attacks (and destroys) your red blood cells. Anemia is initially diagnosed with a complete blood count (CBC), a commonly performed blood test. Sometimes this test is run because you are having symptoms of anemia; sometimes anemia is identified incidentally when a CBC is drawn for routine annual labs. Your healthcare provider will be looking for a decrease in hematocrit or hemoglobin (or less commonly, the red blood cell count). In adults, normal hemoglobin ranges from 14 to 17.4 g/dL in men and 12.3 to 15.3 g/dL in women. The RBC count in men ranges from 4.5 to 5.9 million cells per microliters and 4.1 to 5.1million cells per microliters in women. Levels below these ranges would be considered anemic. After diagnosing you with anemia, your physician will work on determining the cause of it. 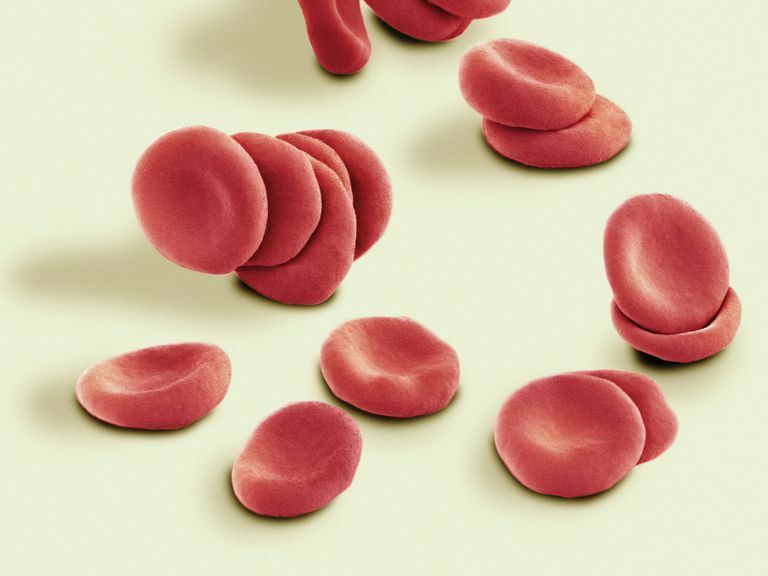 The first hint of what is causing your anemia might be indicated by the CBC as well, as it reports additional information about the red blood cells, such as size (mean corpuscular volume), variation in size (red cell distribution width), and concentration of hemoglobin in the red blood cells (mean corpuscular hemoglobin concentration). The size of your red blood cells, in particular, can provide excellent information about the underlying cause of anemia. If they are deemed to be small (microcytic), there is a good chance that iron deficiency is to blame. Red blood cells that are normal (normocytic) likely indicate anemia of inflammation. Large red blood cells (macrocytic) can be tied to deficiencies in folate or vitamin B12. Two other tests that are commonly included in the early workup of anemia are the reticulocyte count and the blood smear. Reticulocytes are "baby" red blood cells that have just been released from the bone marrow. When you have anemia, the bone marrow should increase the production of reticulocytes. A blood smear allows a physician to look at the red blood cells under the microscope. The blood smear gives additional information about the number, size, and shape of red blood cells, which may indicate the underlying cause of anemia. Your primary care provider may refer you a hematologist, a physician who specializes in blood disorders, to determine the cause of your anemia. You will likely undergo more blood work to confirm the cause of your anemia. Some forms of anemia do not have any specific treatment and may be lifelong. If the anemia is caused by a chronic illness, treating the underlying condition might improve your anemia. After learning you have anemia, it's natural to ask: What caused it? What do I do about it? It is important to recognize that some anemias are easy to diagnose and treat, and others can take a long time. Don't ignore how you are feeling or resign yourself to your symptoms. Be open and honest with your physician and work together to feel your best. Marks PW. Approach to Anemia in the Adult and Child. In: Hoffman R, Benz Jr. EJ, Silberstein LE, Heslop HE, Weitz JI and Anatasi J eds. Hematology: Basic Principles and Practice. 6th Ed. Philadelphia, PA: Elsevier Saunders; 2013. Schrier SL. Approach to the adult patient with anemia. In: UpToDate, Post TW (Ed), UpToDate, Waltham, MA.